With our expansive container yard and our large intermodal department, we can handle huge volumes. 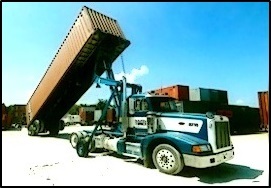 Frontier Logistics is capable of transporting, packaging and storing containers. Our 12 acre container yard is capable of storing 2,000 containers (or 100 million lbs. of material). We have a heavy lift machine for container loading, unloading and stacking. There are four yard hustlers to move containers in and out of the terminal. There are 55 container trucks to import and export containers to the port. The on-site certified scale is calibrated frequently and used for accurate container weight. Because our container yard has port access, the import and export of overweight containers (up to 58,000 lbs.in a 40’ container) can be transported worry free.